Bernina Crystalworks Basics- March 16th at 10am-1pm - going batty! 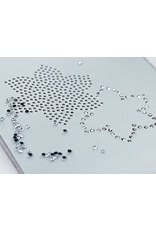 With the CrystalWork tool, forms and patterns are precisely punched out as small holes. This hole stencil is filled with crystals that are then extracted using adhesive film in order to be ironed on to material. Your imagination knows no limits. In this class you will master the basic steps to complete any Crystalwork project!